A lose-lose situation: the DWP’s Catch 22. 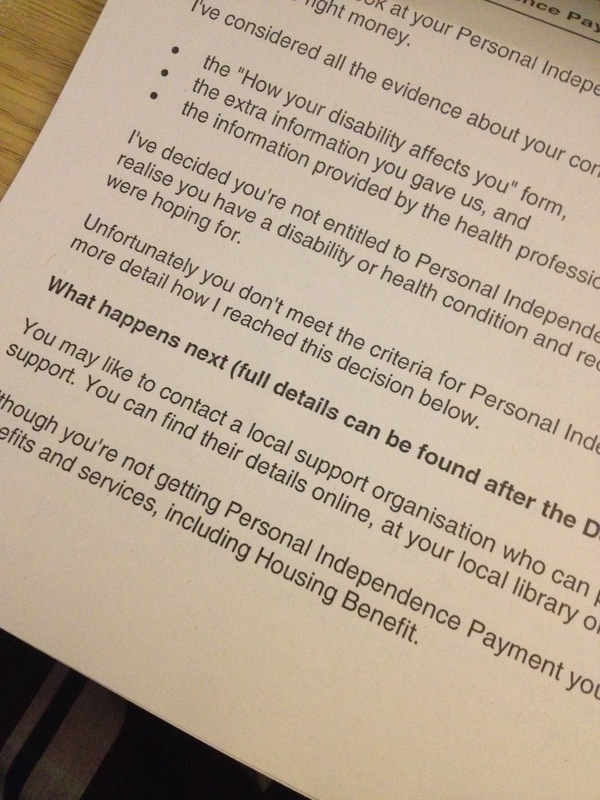 Last time I wrote about having my Personal Independence Payment assessment I said it felt like an exam I had to pass. As it turns out, this time I seem to have failed. Yep, after doing my renewal application for my PIP, I was declined. I was half expecting this anyway but it still came as a shock. So now comes the mandatory reconsideration period and the appeals process. I’ve also requested a copy of my assessment to see if it’s as comedic as the last one was. As an ill person, the expectations the DWP have of me are a bit confusing. I’m told that in order to be a productive member of society I have to work, that working is the best option for everyone and that their aim is to get everyone working. Yet, as soon as I try and be productive and proactive, I’m told I’m not ill enough to be receiving any help. Which means you cannot win. You cannot be productive while also being ill as the DWP don’t have a box for that. You can’t be a professional, an educated person because if you’re able to be educated and have a profession then you’re clearly not ill. The truth, as it always is, is far, far more complicated than that. Me doing an MA does not means I don’t still have chronic pain. The fact I can write a blog entry doesn’t mean I won’t have to go to sleep for the afternoon due to chronic fatigue. Reading a book doesn’t mean I don’t need my pain medication. You’re told to be productive yet that means you’re not ill. If you’re ill you’re told you have to be productive. PIP assessments and me: stuck in the middle with ATOS. Next month, I won’t have worked for two years. It really doesn’t seem that long but it also really does seem that long. I wouldn’t be lying if I said that I don’t know what happened to 2014 and 2015 – a year spent working out what my illness does and how I could live with it, and another year trying to get myself back to as “normal” as I could be while still making accommodations for my condition. Time moves fast when you’re doing very little, it seems. I’ve had two ATOS assessments in that time, both for PIP. The first one was kind of a blur – I’d been ill for a few months, I didn’t really know what was going on, what medications I should be on, how I was going to pace myself, all the things that you eventually pick up and learn the longer you live with being ill. My second assessment was last week and it was a different experience. Not because it was conducted at home rather than at their offices, or because the questions were different (they weren’t) but because I’ve lived in this body with this condition for nearly two years and I know it a lot better now. I’ve gone through different stages of dealing with being ill. For a while I was just “ill”. One day I could do something, then over the course of a weekend I just got ill. I can remember the weekend clearly as the Monday was the final time I went into work. Then you start looking for reasons and ways to help. Diagnoses, medications, pacing, reducing the amount you achieve in a day. Resting a lot. Sleeping a lot. Getting into the groove of “being ill”. And then once you’ve got the rhythm of your illness – you’ve worked out that your big flares usually come a week after the event that triggers them, that if you spend the morning in town you’d better not plan any activities for the afternoon, that if you’re going to need to be clean and showered for some reason you’d best plan that into your previous day (also your definition of “clean” gets reeealllly loose…) – you start to live with it rather than fight against it. This doesn’t mean everything is roses and happiness, far from it. You get days of pain and days of exhaustion, you can’t drive as far as you used to or walk as far or be able to use your brain and think after 3pm. But you have what I called my “new normal” – and you forget that this isn’t other people’s normal. I’ve found myself stuck in a really bizarre place. I’ve just finished a postgraduate degree and I’ve worked for ten years in a profession (granted the profession has been ripped to pieces by the Tories but I digress…) and so my desire is to work, because I love my profession and I want to be able to practice it. But then, you’re put in a position with your ATOS assessor where you have to describe in minute detail how you can’t always cook your own meals, how sometimes you don’t have the energy to wash your own hair, how someone else has to come in and do your vacuuming for you. I’ve found it very difficult to take both the realities of being a professional, and of someone who is ill and needs assistance and help with everyday tasks, and apply them to the same person – me. How can I be both those people at once? And I know where this confusion comes from. Having an ATOS assessment makes you constantly second-guess yourself. Can I walk further than I said I could? If I can open a can now does that mean I can actually cook? Am I better than I was, am I more able than I think I am, am I being lazy? The constant second-guessing and the need to prove that you’re ill or disabled makes you stand face to face with the worst bits of your illnesses. I can’t leave the house for days, I can’t wash my hair more than once a week, I can’t cook my own dinners. It’s almost impossible, to me at least, to take that view of myself and pair it with “I’m a professional with a postgraduate degree and the desire to work”. The DWP make disabled and ill people justify the worst of themselves and then they expect them to “pull up their bootstraps” and make the best of the situation. After you’ve been repeatedly shot down by churning out all the reasons your mind and body is unable to work properly, under the fear that you won’t be believed, it’s a difficult task to turn that around and be motivated and positive. But hey, maybe that was their plan all the time. Motivated and positive ill and disabled people get ideas and opinions and the means to express them, and we can’t be doing with that.